I’ve taken this project pretty seriously. The Eldar hold a very special place in my heart. 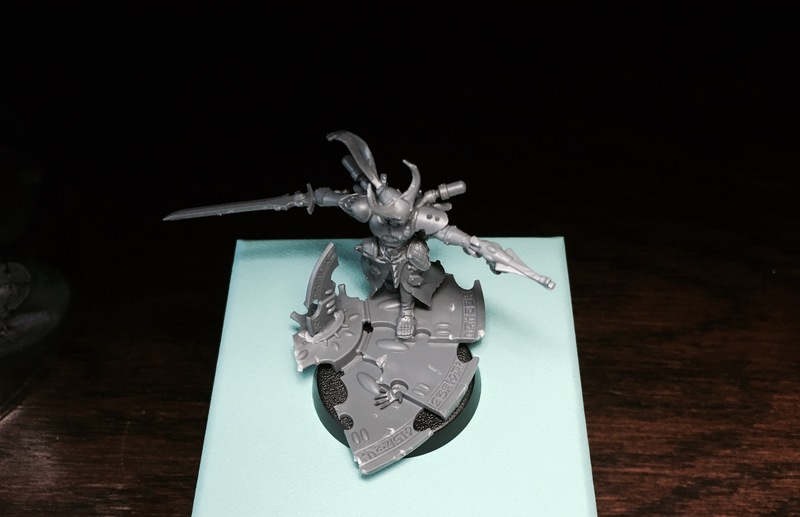 For two decades I’ve decided to start an Army and then not make it, unable to see enough of the madness I need to interpret the art and background into something unique. Something that pushes the vision for the race further. I thought hard what to make and played with several ideas. Then decided that I really don’t need another army project, so the model should work as a standalone piece. And individual. I wanted to study something Eldritch that was an outsider of the Craftworld archetypes, something that could fit in the Inquisitorial worlds and warrior bands I create with my friends. I’ve always been fascinated by the Black Library, the floating prison of information traveling the web way to avoid visitors. And which individual would ever have access? With my imagination running riot, I settled on a Solitaire of sorts, one of the guardians of the library, a special one, carrying the death masks of his slain Masque with him, by his own hand? A Rogue? A Pariah assassin? Fantastic concept. The Black Library has always fascinated me as well. The idea of a rogue Solitaire really opens up a lot of excellent narrative elements. My favorite aspect of the model is his collection of masks; it really conveys the theme you are working with, and adds to his frightening nature. 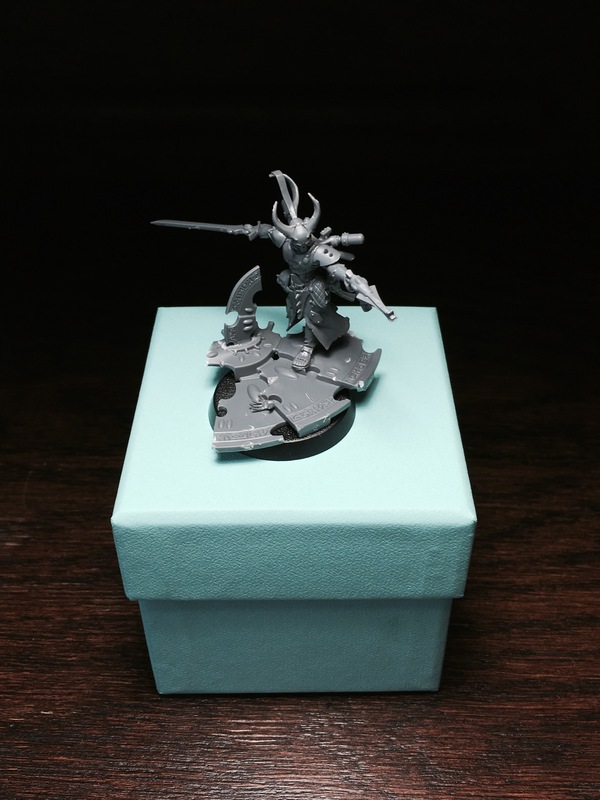 Basing the model around a Wrack was an interesting choice, and one I feel few would consider when creating a Solitaire. I feel this sort of out-of-the-box thinking is something you excel at when converting, and feel it works really well here. And despite the walking pose of the base model, you achieve quite a lot of grim motion with the model. Good job! Thanks Eric. So good to hear from you. I’ve been loving your Nurgle Terminators while being useless during the summer. I think the wracks legs have grace to them, and nice “skeletal” feet. Johan from Convertorum and I at the time of the Harlequins coming out felt they were too floppy and discussed it a lot. So from the go, this was going to be about finding grace and movement without bounciness. If (or is it really when?) this grows into a bigger project, I will definitely use some of the flippant poses too. Well you’ve set the bar high for the other guys that’s for sure! Other than that I can really associate myself with your feelings for the Eldar race. I’ve been there so many times myself but always pulled away in the last minute. 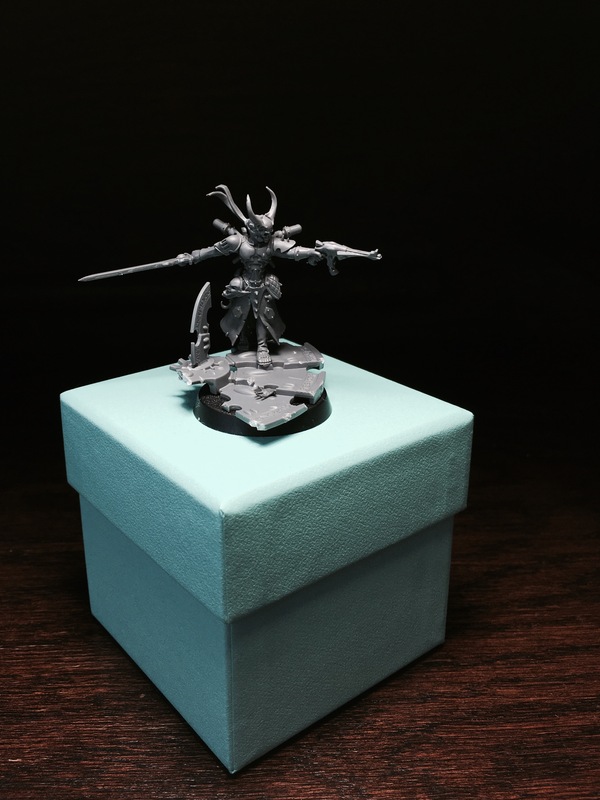 The only Eldar miniature I’ve ever made was Ilieth the exodite sniper on the tail end of the (un)Invitational. Anyway, this’ll definitely be good and it is fun seeing Eldar properly grimdarked. They suit it just fine. Thanks Tommy! 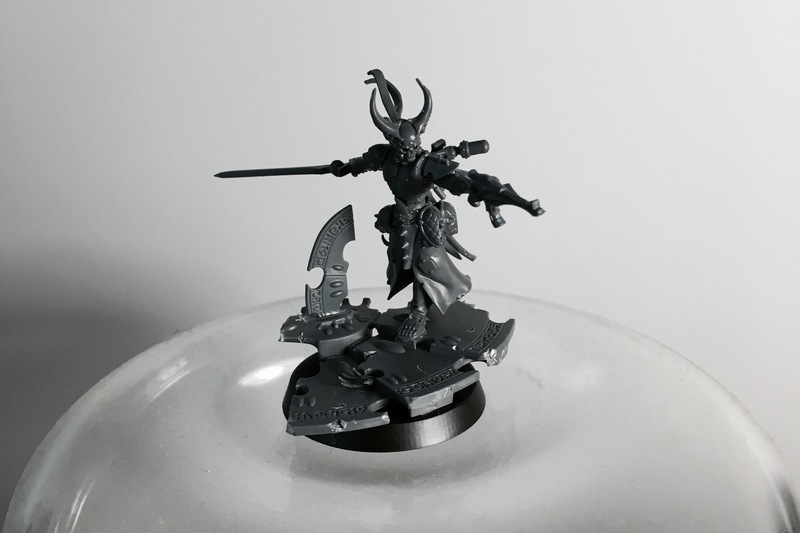 I had a small Eldar force in 2nd edition, and as a tall, skinny, “elvish” speaking scandinavian, who has studied yoga, mindfulness, martial arts… and who loves reading, design and art, the Eldar obviously really resonate. There have been a few tries on the way, so lets see how the stars are aligned this time and how my crazy painting plans come out. I really love this, Migs. It looks stunning. The steps are really inspired. Thank you my friend! 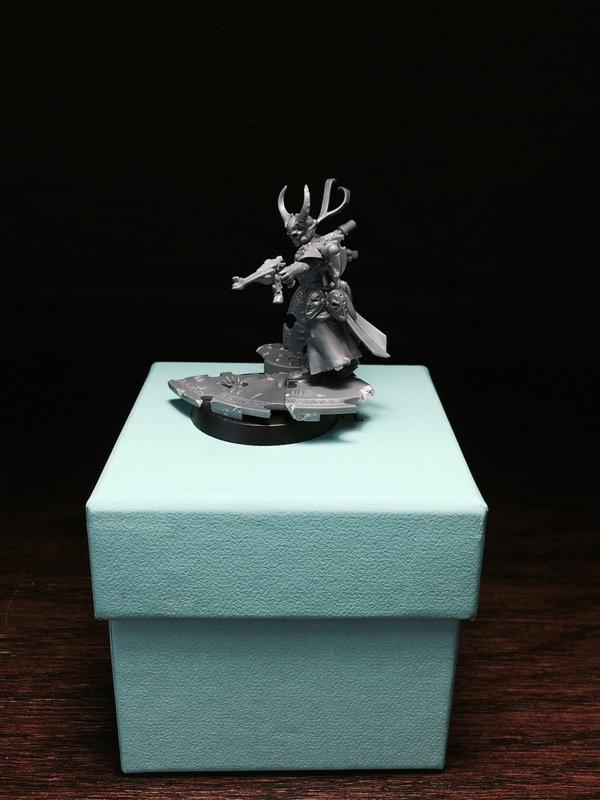 Basing is so crucial – something I’ve always tried to emphasize with every model I’ve made. Aw, nice work Migs, that is such a cool take on the Eldar. I must admit, I’ve always struggled to get much inspiration from them as a race – their background just seems so well defined to me (with the possible exception of the Exodites). Looking forward to seeing you push the boundaries on this concept, giving the fey ones a touch of grimdark is long overdue! Fantastic. Such grace and sinister appearance in the same pose. That base is really setting the scene. Bravo. This is truly inspiring. This is brilliant and so inspiring! Can’t wait to see more of your work on the harlies being about to start an army myself and trying to figure out a way to make it unconventional..
It’s a great take on the race and an eye-opener fluff-wise. For me the whole race is really a big unknown when it comes to fluff and bitz, so it’s a nice experience to delve into it now. Loving the base too! Can’t imagine this getting any worse with color..
What Toni said. Looking forward to seeing this thing painted!